Miss Maine USA, Emily Johnson, has announced that she has decided to skip Donald Trump's Miss USA Pageant to attend her sister's wedding. This is a surprising choice and a huge sacrifice on her part. It takes years of work to earn such a prestigious title, plus by missing this event, she is giving up her title, and the valuable prizes associated with it! The first runner-up, Ashley Marble, has happily accepted this wonderful opportunity to represent her state as Miss Maine for the pageant. The executive director of the Miss Maine USA pageant Mackenzie Davis "understands Johnson's reasoning, but she says Miss Maine is a serious commitment and that she's disappointed Johnson withdrew from her duties," according to MSNBC News. Although this certainly proves her dedication to her family, it seems like her sister could push the wedding by one weekend to show her support for her loving sister's dreams. Skip Kelly Productions is one of the most sought after entertainment companies in Jacksonville. From private parties to weddings and special events all over the city. Our team of expert lighting technicians and sound engineers can assist you in creating an event limited only by your wildest dreams. If you are looking for a truly professional Jacksonville DJ, find out what we can do for you. Such a creative wedding proposal! Click the source link to watch the video of the whole thing! “Am I losing my mind?” Marlowe Epstein wondered. It wasn’t until she landed on 51 Across that she figured out what was going on. “Words with a certain ring to them,” she read aloud. “Will you marry me,” she suggested, and looked to her boyfriend, Corey Newman, for agreement. For months Newman, 28, had been trying to figure out how to propose to Epstein. “I wanted to do something unique,” he said. One day as he watched her sit immersed in a crossword puzzle — as she so often is — he had an idea. And with a little help from Bob Klahn, vet­eran crossword creator, Newman’s plan became a black-and-white reality in Sunday’s Washington Post Style section. Careful Washington Post readers may have wondered about the bonus puzzle Sunday, and devoted puzzlers probably picked up on a theme. Clue: Seek to form a union? Answer: Pop the question. Clue: Wedding gown material. Answer: Lace. But even Epstein, 31, didn’t notice how many questions were intended specifically for her. Other answers included “Aiken,” her home town in South Carolina, and “Corey,” her boyfriend’s first name. Saturday morning, she said, “just seemed like business as usual to me.” When she woke up, there was a cup of coffee waiting for her. As rain whipped against the windows of the couple’s Alexandria apartment, she settled on the couch with Newman, who was working on a crossword. “I’m stuck,” he said, prompting her to help. Newman had originally planned to propose Sunday, but a citywide scavenger hunt they’d planned to participate in was bumped to that day, so he made a last-minute decision to do it Saturday instead. For an hour that morning, he raced around Old Town, looking for an early Sunday edition that would have the puzzle, but none of the shops had received them yet. So he did what any desperate man would: swiped one from the front of an office building. No one’s there on the weekend anyway, he figured. Two weeks later Epstein, who works in communications, invited him to join some friends at her place as a blizzard was moving toward Washington. After everyone else went home, the two kept talking and the snow continued falling. By early morning Newman realized he was stranded; he wound up snowed in with Epstein and her roommate for four days. They saw each other only sporadically after that, but when Newman, an event planner, moved from Dupont Circle to Old Town in late July, their get-togethers became regular. By September, they were dating exclusively. Right away it was serious. “Three weeks after we started seeing each other, everyone was asking, ‘When are you two moving in together?’ ” Newman said. That was the idea. “I’ve been telling her forever that she was special,” Newman said. “And I wanted to do something so she would know that I meant it. 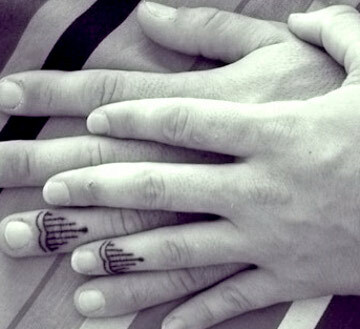 I found this article about getting wedding tattoos instead of wedding rings! I think it's a really cool idea! Not my thing, but still a cool idea! Check out the link at the bottom for more pictures. I saw this story about Pete Tong, who is one of my favorite presenters on BBC Radio 1. I remember listening to old, poor quality downloads of Paul Oakenfold mixes that were hosted by Pete Tong. I still have 'em! Anyway, thought I'd share. Pete Tong has said that it would be an honor to perform at the royal wedding. The DJ and producer, who celebrates 20 years at BBC Radio 1 this week, told DS that he was "not at all" bothered by suggestions that playing the event would affect his credibility. Asked how he would respond were he asked to man the decks at the wedding, Tong said: "I would definitely do that one, without a question. Obviously it would be a complete honor and a one-off and I like doing things like that. "I was fortunate enough to meet Prince William at Radio 1's Big Weekend last year and rather than just a handshake - one of those nods of just ticking a box and saying I've met him - he wanted to engage in a real, proper music conversation. "He'd been to Ibiza, he knew about Ibiza, and he told me what he liked and he seemed genuinely enthusiastic about it. He seemed genuinely excited to meet me, which sounds bloody stupid!" Of 'celebrity DJs', Tong added: "I've never been too po-faced about it. We're in the entertainment business and it takes all shapes and sizes... If people have paid for it and are entertained by it, it's fine. "Danny Dyer - who I worked with on Human Traffic - he's a really nice guy and a really talented actor. He started DJing last summer and I kind of missed it. "It wasn't on my radar until someone said, 'It's amazing. He's become a phenomenon. He's pulling over 3,000 people in San Antonio!' I would say good luck to 'em." A Celebration of Pete Tong airs this Friday, April 8 at 7pm on BBC Radio 1.